Seahawks coach Pete Carroll said he was already “on to Chicago’’ when he met the media Tuesday afternoon. But since it was his first presser since Sunday’s season-opening 27-24 loss at Denver, the Broncos game was still at the top of everyone’s mind. Carson and rookie first-round pick Rashaad Penny each got 25 snaps and seven carries in Sunday’s game. But Carson turned his carries into 51 yards while Penny managed just eight. And Carroll said the playing time may not be so even moving forward saying that Penny appeared to feel the effects of not playing the final three preseason games after suffering a broken finger in practice. Carroll said quarterback Russell Wilson did some good things in the game but that he also “could have played better,’’ specifically in avoiding a couple of the sacks he took that killed drives. Wilson was sacked six times but said after the game he probably could have avoided three of them with better decisions. As Carroll said, the fact that Seattle allowed six sacks means he can hardly say the pass protection couldn’t have been better. But noting that Wilson ran himself into a few sacks, he said that number doesn’t necessarily accurately portray how the offensive line played. 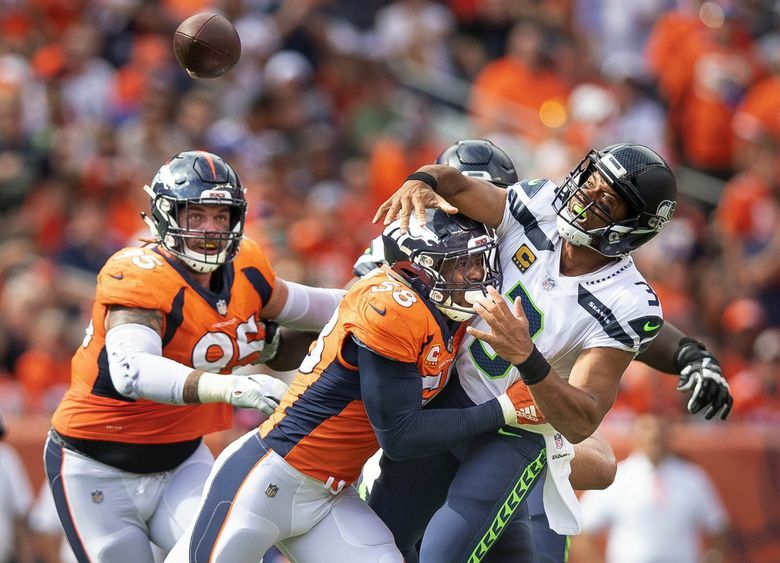 In particular, Carroll defended the play of right tackle Germain Ifedi, who spent much of the day going up against Von Miller, who finished with three sacks. Not all came on Ifedi, though (Pro Football Focus said he allowed just two pressures overall) and Carroll volunteered a defense of Ifedi. Griffin started last week in place of K.J. Wright at weakside linebacker. But after the first few series Seattle went with a rotation at the position with Austin Calitro playing on run downs and Griffin on passing downs — Griffin ended up with 41 snaps and Calitro with 34. Carroll said Griffin — who was making his first NFL start and also at a position he did not play in college — made some mistakes. Carroll said the team will watch Griffin and Calitro — who was also playing in his first NFL game Sunday — in practice this week and then make a decision on how to divvy up playing time. That Carroll mentioned a few players vomited and a few others had to take IVs, which might have been attributable to playing in an elevation of 5,280 feet, had some on social media wondering why the team didn’t leave earlier for the game — Seattle flew to Denver Saturday afternoon, as it normally does for Pacific or Mountain time zone games. Carroll, though, pointed to studies showing that someone would have to be in the altitude for an extended period to adjust and that a body may actually react better in the first 24 hours as a reason for not going early. Specifically, Carroll said the Seahawks struggled to adjust in play-action situations and said defensive line coach Clint Hurtt was talking to the line specifically about that. “We got stuck on the line of scrimmage some,’’ Carroll said. Film review shows that Jarran Reed did indeed force a fumble by Denver’s Royce Freeman in the first quarter and may have had a recovery. But in something Carroll continues to lament, Denver ran a hurry-up offense on the next play and was judged to get the snap off before he could get his challenge flag out. But he wishes that he’d made the decision a little earlier. While Seattle players ere signaling that they had the ball Carroll tends to rely on coaches from up in the press box to look at a review and give him a final “yes or no” before throwing the flag and he said that simply didn’t happen in time Sunday. Denver went on to score its first touchdown on the drive. Carroll also lamented that it was hard to tell if Demaryius Thomas was in bounds when he caught a 4-yard TD in the fourth quarter that proved to be the winning points. Officials initially signaled incomplete before huddling and ruling it a completion. That meant a review meant that they had to overturn a completion, which is generally regarded as being less likely than siding with the call on the field. But he then noted the TV copy made it tough to see if Thomas was in or out. The Seahawks blew a chance at three points in the second quarter Sebastian Janikowski missed a 51-yard field goal and then when Denver was offsides, a 46-yarder on the second attempt. But Carroll said there was no real reason for either miss other than that they were just missed. Both plans snapped closer to the left hashmark and both were pushed to the left. The Seahawks want to get back to running the ball more this season but struggled to do that Sunday with just 59 yards on 14 carries by Carson and Penny. Meanwhile, Seattle threw it 33 times with Wilson sacked another six, nowhere close to the kind of run-to-pass ratio the team wants. Carroll said frankly that 14 runs was “not enough.” He said being behind a lot of the game played a small part in it but said the main reason was that Seattle was 2-12 on third downs and couldn’t maintain many long drives — 11 of Seattle’s 15 drives last four plays or less. Seahawks coach Pete Carroll reviews Sunday’s loss to Denver.